Quote: "Bloom is a singer songwriter with soul." Warren Bloom is one serious looking fellow, pictured playing his acoustic guitar solemnly. But the harmonica coloring and castanets driving the gypsy love song “Tango Lullaby” reveal a far more playful artist than you might expect. Bloom is a singer songwriter with soul. Many of Bloom’s songs have elements of positive thinking self-talk. They show up in “I’m On My Way,” “Heavy Load” and “Starting Over Again.” You get the impression Bloom just went through a breakup, especially when he sings these lines during “I’m On My Way.” “On my way, I’m gonna steer clear away from you.” He hasn’t given up on love, however, as “You Really Caught My Eye” suggests. You learn from the past, but you move on, he seems to be saying. ”Tango Lullaby” is not the only place where Bloom’s look contrasts with his sound. “I’m On My Way,” for instance, incorporates synthesized sitar into its soft rock sonic. Such an element is usually reserved for psychedelic rock revivalists. But Bloom puts this unusual ingredient to tasteful use. I honestly didn’t expect this much musical variety after looking at Bloom’s CD cover. I suspect other consumers may feel the same way. Image should never take the place of substance, but Bloom may want to consider a hipper look for his CD artwork. That might help him attract a discerning audience to his music. [Warren's] vocals...seem as if he’s just talking to you rather than belting out some tune. That sort of familiarity lends well to his take on roots rock and Americana; if there’s studio wizardry going on here then it’s well concealed in a veneer of sensible down-home knee-slapping rock-n-roll with a twang that’s almost alt-country and almost John Mellencamp. BloomTunes Productions has released Warren Bloom's single, Miracle Morning, for sale on Mini-CD from his 12-song CD, also called Miracle Morning. "We recorded the song on a mini-CD as a publicity stunt," said Bloom, "When we saw how much people were excited to get them, we realized that this would be a great way to sell a single song." the advent of digital download stores, we see this medium as a possible compliment to individual song sales," said BloomTunes partner, Dwight Harris, "We are contemplating taking requests to include any two songs." For now, the second song on the disk is a version of Warren's tune, Thanks for the Fantasy. Mini-CD's are often used by software companies and other industries to run on a computer for a product demo. Over 20 minutes of formatted music can be recorded. In addition to a computer drive, it can be played on any single stacked top loaded CD player. 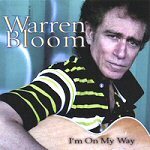 The Warren Bloom mini-CD single is priced at $.99 and can be purchased from the BloomTunes website. Warren Bloom is an exciting New York City musician who excels at a centuries-old tradition that of the romantic serenade. The 12 original songs on his debut record, Miracle Morning, weave a seamless tapestry of folk-inspired melodicism fortified by lyrics that are a combination of optimistic yearning and gallant determination. But Blooms voice is not that of the tortured romantic. His are grown-up love songs that describe the quest for control over emotion and experience. Produced and mixed by Warren Bloom and John Pocrnic, the guitar-driven arrangements are simultaneously meticulous and delicate. Intimate interplay between Blooms own fingerpicking and the lead guitar of John Amato lend detailed layers of warmth to every song. Harmony vocals by guest singer Peira lift the melodies to levels of radiance that shimmer and glow without sounding sugary. The rhythm section of drummer Chris Olsen and bassist Steve Geller perform a variety of duties on the record, particularly when called upon to swing with a Caribbean rhythm on Jamaican Beat or glide through a Latin reverie on Pretty Senorita. Uniting everything on Miracle Morning, however, is Blooms unflinching commitment to writing a good song. If you dont have the melody, he says, what have you got? Each song is tailor-made for Blooms accomplished crooning, enabling him to cover his musical terrain with ease and confidence. This gives the music a comfortable, stone-washed texture that contrasts nicely with the lyrics steady focus on the Everymans pursuit of happiness. Miracle Morning is an unabashedly old-fangled dissertation on love and romance, and a comfy chair in a musical universe over-furnished with iron maidens. This month Blue Note will release a new CD from explosive chanteuse Norah Jones dubbed Feels Like Home. Pianist/composer/educator Geri Allen has recently signed with Telarc and will soon release her first CD in 6 years. A singer new to the recording studios, Warren Bloom has released his premier CD Miracle Morning on the Rock Chain label. Bloom’s high tenor range is a rare find in the CD’s genre and this uniqueness should find a cult for this mellow singer/guitarist.